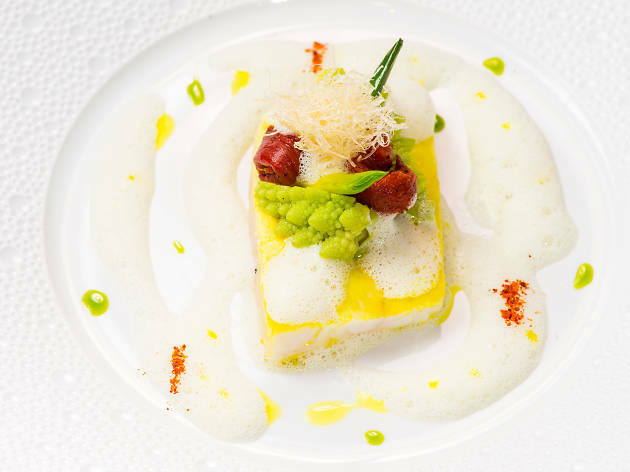 He was anointed in 1989 as the “Chef of the Century.” The most-awarded chef alive, he has collected 32 Michelin stars to date and has mentored Gordon Ramsay and Éric Ripert. He retired in 1995—and thank God it didn’t stick. 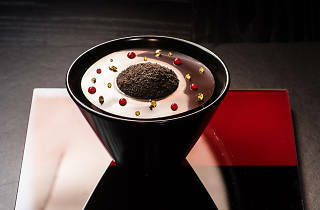 In 2006, he opened a midtown outpost of L’Atelier de Joël Robuchon, his eponymous principal chain. When it closed in 2012, New York was left as one of the only major food cities worldwide without his presence. 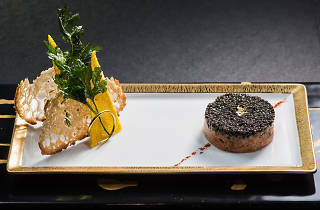 Now Robuchon is back, this time in the Meatpacking District. 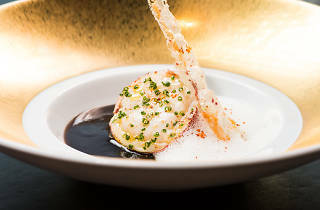 This ecstasy was partly amplified by sitting at the counter, an eating style borrowed from omakase restaurants that Robuchon pioneered in Western fine dining. 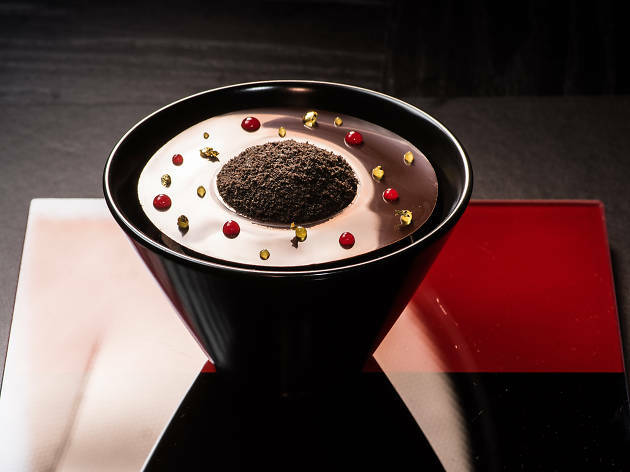 Its Mondrian geometry of red and black is both seductive and cooling, and its views of the kitchen offer a feast for the eyes: a ballet whose dancers flit and twirl with hypnotic grace. 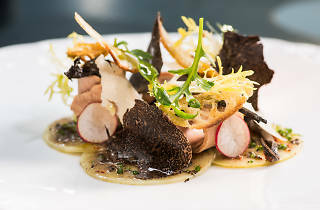 The food, elegantly high-minded as it is, arrives as a natural, comfortable extension of that delicate dance. 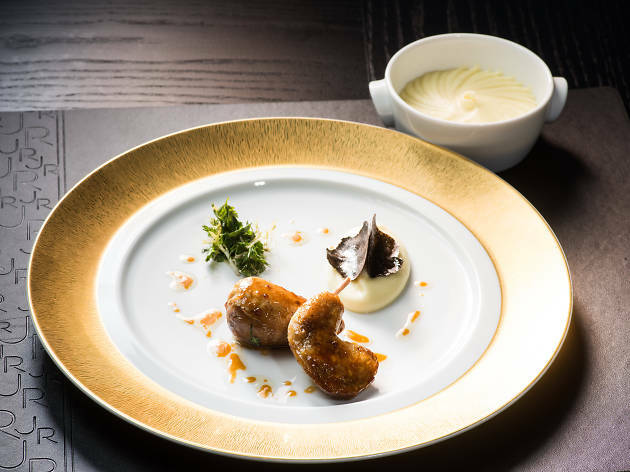 Our palates so enjoyed these pirouettes that L’Atelier is almost more ballroom than restaurant. 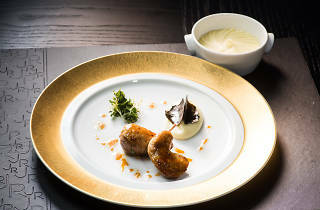 In the eight-course seasonal tasting menu—choose the Wagyu rib eye for quantity, the foie gras–stuffed quail for quality—dish upon dish offers a varying sensory overload. 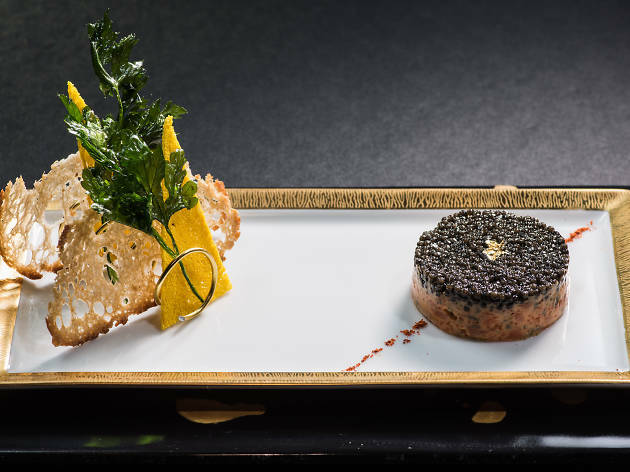 A thick puck of salmon tartare under a shtreimel of French Imperial caviar is as playful as it is decadent. 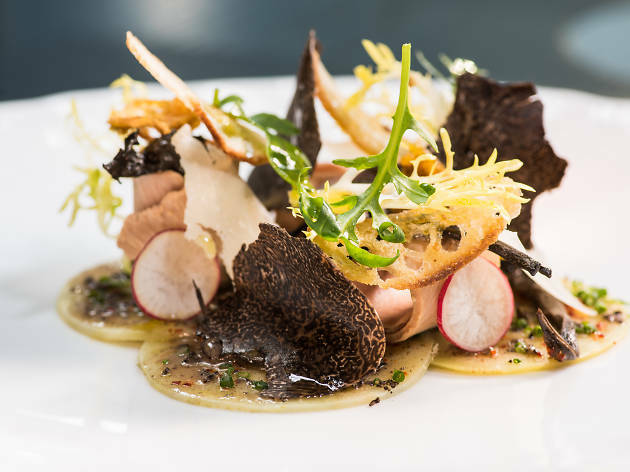 A salad of artichoke, shaved Parmigiano and foie gras makes an earthy game out of foraging for its plentiful black truffle wafers. In lesser restaurants scallops are routinely seared until crisp and chewy; Robuchon’s lands on the tongue with the hefty saline pat of its seaweed butter sauce. 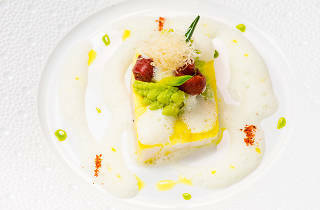 The palate cleanser, hilariously, is a mojito, deconstructed into rum gelée, mint sorbet and lime foam. At one point, this reviewer had trouble eating because he was smiling too much. It’s a dinner that transcends quality, extravagance or privilege to become an absolute, unfettered joy. “Do you have any allergies?” asked our waitress dutifully before we ordered. “Yes,” we joked. “We’re deathly allergic to bad food.” She laughed, probably louder than was warranted in this temple of perfectionism. “Don’t worry,” she said. “We don’t have any of that here.” Mon dieu, how right she was.